The Doubletree Cariari Country Golf Club and hotel is only 5 minutes from the Juan Santamaria International Airport and 10 minutes from Costa Rica’s capital, San Jose. This hotel is one of the country’s best, with 220 oversized guest rooms and 24 suites. Their 18 holes, Par 71 Championship golf course designed by George Fazio is located on site as well as 12 tennis courts, an Olympic size pool, a modern health club, jacuzzi, beauty parlor, business center, casino, restaurants and gift shop. Laundry & valet, baby sitting, money exchange and 24-hour medical services are also available. Designed by George Fazio and built by his famous nephew, Tom Fazio in the early 1970’s, The Doubletree Cariari Hotel and Country Club was the first and only 18 hole golf course in all of Central America for nearly two decades. This well-manicured course was built on an old coffee plantation in the heart of Costa Rica’s Central Valley, is as impressive as it is beautiful. Events such as the Central and South American Open, co-sponsored by the U.S. Professional Golfer’s Association, the Friendship Tournament as well as many amateur tournaments have been hosted here. Many of the worlds best have played here, such as Chi-Chi Rodriquez, Tom Weiskof, Larry Ziegler, Raymond Floyd, Peter Jacobsen, David Graham, Curtis Strange, and much more. Well guarded by carefully placed sand traps, the large greens here are well-maintained Bermuda grass in excellent condition and roll fast and true. Posted at 6,590 yards, this heavily wooded golf course actually plays much longer. The fairways are often narrow, but with few fairway bunkers. The exclusive Cariari Country Club is a beautiful and exciting course that has received international recognition. It will present a challenge to all levels of golfers, playing here is an unforgettable and enjoyable experience! 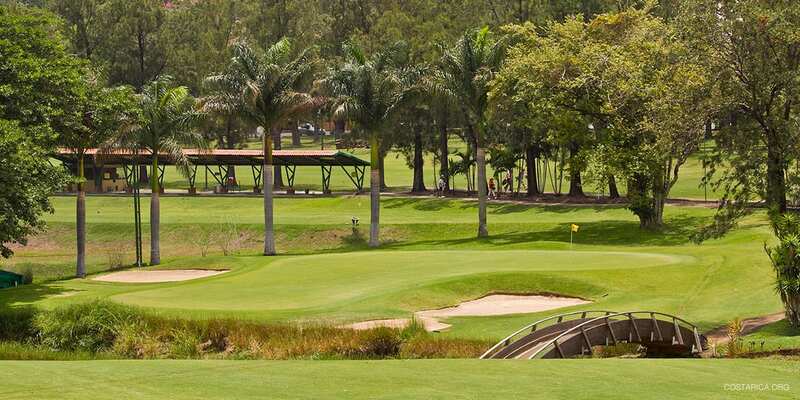 With fewer than 200 golfing members, this golf course is one of the least crowded courses found anywhere –this is true with all the golf courses found here in sun-filled, tropical Costa Rica! This is the perfect area to start off a trip to Costa Rica. It is very close to the airport and the City of San Jose. Within the area, you will be close to almost everything. the beaches are only a few hours away and the Volcanoes you can see from the hotel window. Check out the Poas Volcano or even the Arenal Volcano. Also, visit some nearby cities such as Cartago and Turrialba.